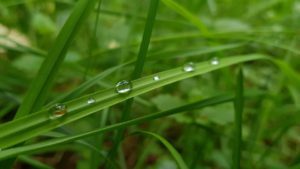 Ever wonder why the grass look greener after it rains? Well…After it rains, there’s typically more water available in the soil for plants and sod. When plants absorb rainwater, they are also absorbing nitrogen from the organic matter that’s in the soil. Here’s how that works: soil microbes cause the dead roots to decay almost creating a compost to your lawn, this action takes place underground and naturally, without your intervention. The grass roots are made up of large chemical compounds consisting mostly of carbon but also some nitrogen. The soil microbes use carbon and some of the nitrogen to cause the dead roots to decompose. As this happens, a portion of the nitrogen is released back into the soil as a sort of waste product. This causes the soil to have more nutrients in rainwater than in tap water. As rain soaks into the soil, it activates the microbes to release more nitrogen. The grass benefits from the freshly fallen rain because the flush of water allows the roots to absorb this “new” nitrogen as well as the nitrogen that the microbes have previously released. At the same time, “the grass is very active with photosynthesis” when the sun returns. Here is a little bit more science for you. Did you know that something else happens with nitrogen when it rains? The atmosphere is made up of 78 percent nitrogen gas. It also carries particulate nitrogen in the form of ammonium and nitrate. When it rains, the rain brings some of this particulate nitrogen down onto lawns in the form of nitrate and ammonium nitrogen. « J&J Lawn Service, Inc for all of your lawn service and landscaping needs.